Given the opportunity, some of us Chihuahuas like to wander. It’s not that we don’t like our human companions, it’s that an exciting smell or interesting animal catches our nose and off we go. If your Chihuahua is a wanderer or if you take your Chi on many long walks and trips, it’s always a good idea to have a collar with a license and ID tag. The next best thing is a microchip. I have one. The iPhone has a great way of finding lost pets or reporting found pets that are lost. It’s the new PetRescuers by HomeAgain. Give it a try. It’s free. Wouldn’t it be great if you find a lost dog and return it to it’s owner? “Be a hero for lost pets! Between 6 to 8 million pets enter animal shelters in the U.S. each year, including many lost family pets. 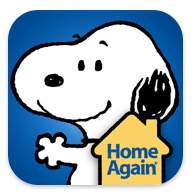 Download the PetRescuers app by HomeAgain, and you can help keep a lookout for lost pets in your area. By receiving notifications about lost HomeAgain pets, you can help get these pets home to their families and keep them out of overburdened animal shelters.